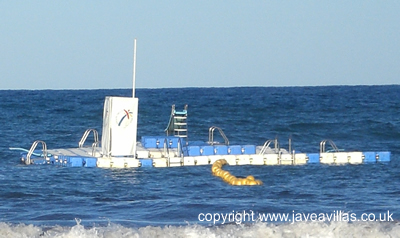 Javea's Arenal Beach is unique thanks to the perfection of the water quality and cleanliness of the beach. Not only is it a World Health Organization accredited "blue-flag beach", but their report concluded it was"near perfect". The sand is very soft and the slope into the sea is very gentle so it's a great place for introducing kids to swimming in the sea. Anew development is the introduction of a diving platform about 100 metres into the sea.This is great for a more challenging swim than just paddling about in the shallows and lets you have a rest when you get there. In the summer the Javea council put on open-air cinema screenings here on the beach. 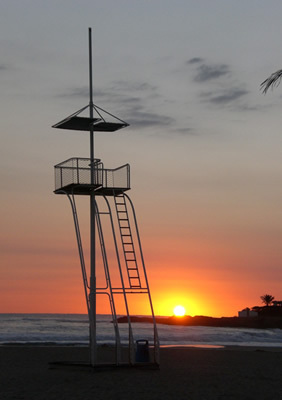 The beach is well served by public showers and toilet facilities, life guards (life guard chair pictured left) and a Red Cross station. The curve of the beach is surrounded by sensitive development -a low-rise promenade featuring a wide selection of bars andrestaurants. 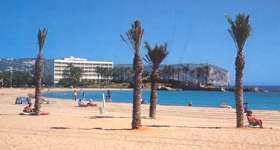 At one end you have the Los Remos restaurant where the Javea webcam is situated (click for live pictures of Javea beach - it's great!) and at the other end you have the Parador de Javea. 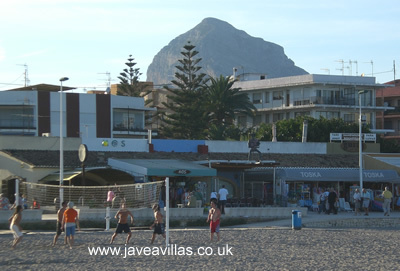 Javea's Promenade is about a mile and a half long and during theday time the bars offers a welcome respite from the sun. You can spend half an hour grabbing a beer or you can take one back onto the beach or an ice-cream. In the evening it is a lovely place to stroll about having pre-dinner cocktails or even getting your picture painted by one of the pavement artists. 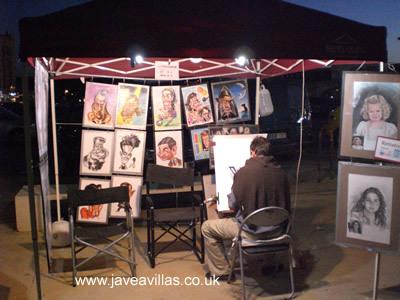 There are also stalls that spring up in the evening selling jewellery, clothes and souvenirs. In the summer you will also find sand sculpting going on, ice-cream parlours, shops selling balls and buckets and spades and sun creams. Just behind the shops that face the sea you will find some fashion stores selling labels likeLacoste and also a couple of decent newsagents. The Promenade is lined with Bars and Restaurants offering everything from Live Bands to Traditional Restaurants. You will find more information about the restaurants of our dedicated page. If you fancy getting about between the beach, Javea's old town and the Port you can use the little train they put on in the summer. This does the circuit all day and right up to late in the evening. It goes all along the promenade, past the Parador, past the chirnguitos that line the gravelly beach, past the jet ski station, to the port, then up the hill towards the old town. I can't remember quite how much it is, but you can buy a ticket that covers you for the whole day - kids love it. As dusk falls it becomes a bit more possible to get active. There are a few volleyball courts and nets on the beach and many games are open to anyone wanting to join in. If you get too sandy there are some good public showers all along the Prom to wash your feet. In the pic you will see the Montgo mountain which towers over Javea and acts as the barrier between Javea and Denia. For some spectacular views of Javea from the Montgo and from the Balcon al Mar, click on the picture. Javea's Parador may look like a really bad example of sixties architecture, and it has to be said, from the outside it is pretty ugly. However, it is really interesting! It is built on the site of a villa that belonged to the commander of this coast for the Roman Empire. There are still some Roman remains, columns still stand in the gardens. Inside the Parador - and you should feel free to go in for a drink - there is a fantastic parquet floor - now I'm not usually interested in flooring (really) but this must be 60 metres by 20 metres, it's classic Spanish flooring (here I go again). Anyway, read more about the Parador by clicking on the picture, and you will also find out about the mystery villa that is falling down next door to it - great intrigue! If you'd like to see more more pictures of Javea I have a dedicated page. I'll end this page with two final pictures of ther beach. I'm sorry one is a bit washed out, I took it in the autumn too late in the afternoon and had to artificially brighten it. What it does show is just how long, flat and soft Javea's beach is and also how gentle the slope into the water is. The other picture is taken at about 6.30 am in September as sun was rising. If you can make it, it's a lovely time to be at the beach, very quiet and as you look out to sea you see the warm light seeping into the sky and then this orange ball rises across the horizon. Sorry to go all flowery on you there - but if you get the chance, catch a sunrise. Please read on for similar pages on Javea Port, and Javea Old Town. If you'd like to contribute (please do) you can use the contact us form to your left.